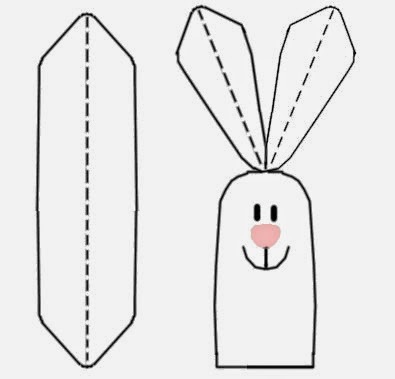 Funky Fabrix: Easter Bunny Finger Puppets, Free Pattern! Gorgeous, quick and easy free knitting pattern for Easter! All kids love simple toys. 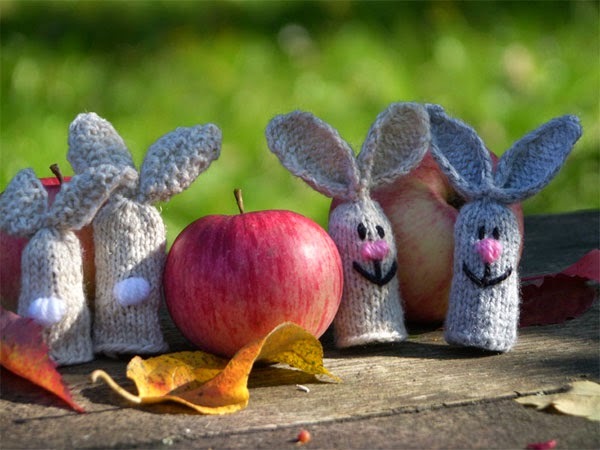 The hare finger puppets are easy to knit, easy to carry around in your pocket toys. They are super useful to take with on long trips with your kids. Hare Finger Puppets are made from very small amounts of yarn. They measure about 9 cm (3,5 inch). Cast on 14 stitches. Distribute among 4 needles and join. Place marker. Ears (make in one piece) Knit flat. Cast on 3 stitches. Cast off and block. Fold ear in half and than saw to top of head. Tail: Using white thread sew hare’s tail. on opposite side of puppet body. (Satin stitch). Nose, eyes and mouth: Satin stitch make a pink nose. Using black thread make mouth with one 1ong stitch coming down from bottom of nose and 2 long stitches at the bottom of the first, one on each side. Sew eyes. Distance between eyes is 1 stitch. Visit here for more details and other great patterns! Happy Knitting and Happy Easter! !